SPW053000 SCOTLAND (1937). 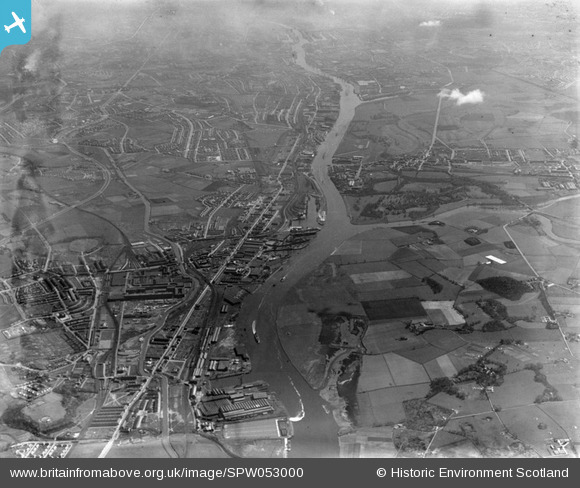 River Clyde, general view, showing Clydebank and Scotstoun. An oblique aerial photograph taken facing south-east. Title [SPW053000] River Clyde, general view, showing Clydebank and Scotstoun. An oblique aerial photograph taken facing south-east. New Kilbowie Park built here 1938/39. Kilbowie Park, Clydebank Juniors FC 1900-39. As the economy recovered from the Great Depression the neighbouring Kilbowie Ironworks wanted to expand. Juniors acquired some land in use as allotments on the opposite (north) side of the railway and opened New Kilbowie in August 1939. Ironically the old ground didn't appear on the OS 6" map until the 1939 revision. Fitting out basin of William Beardmore's Dalmuir Naval Construction Works. This complex was later used by Turner & Newell (asbestos products), Arnott Young & Co (shipbreaking and scrap metal), Royal Ordnance and Babcock & Wilcox (in addition to their large boilermaking works at Renfrew. Empire Cinema : Closed 1959 by Fire : Film Showing " Cage of Doom". United Co-operative Baking Society Building. "UCBS" on Chimney to Elgin St.
Standard Laundry Co Yoker ? Halley Motor Co Works Yoker ? This field was known as Peterson Park in the 1950's and 60's. It had football pitches and the building seen became the changing facilities, The building was also used by the Peterson Park Residents Association for meetings and dances. Also known as Clydeholm Park where the original Clydebank Juniors played.